Can you believe that I still didn't post all my "travel outfits"?! Well... It's true! I have TOO MUCH inspiration and too much cosmetics to review, so I am a little late with this one! What is so special about this outfit? It is probably the most casual look ever (on my blog at least)! I am wearing my H&M hat, Krona moda favourite pants and New Yorker jacket. 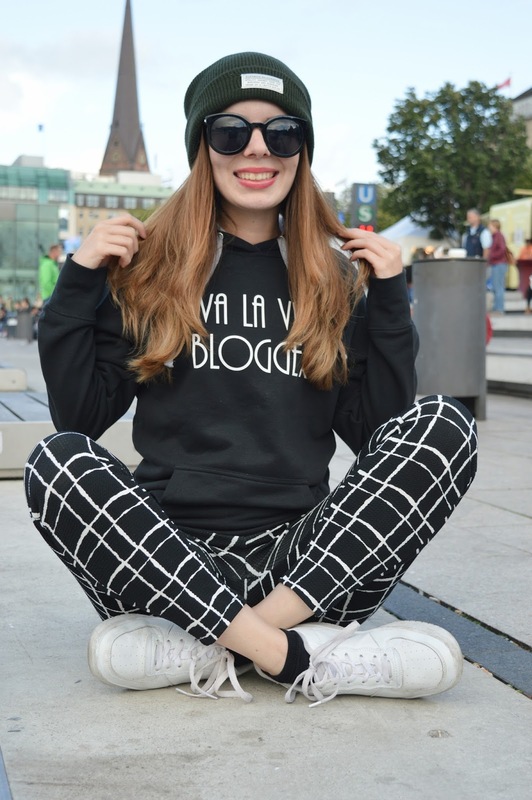 Is this "Viva la vida blogger" on your sweater...? Yep! I have my own blogging sweater, how cool is that? Majice. si (click!) helped me with my long time wish - having a costume made sweater! Thanks a lot! So, this is Hamburg weather, always WINDY as hell and raining. And not raining. And sunshine. Not for long. And rain again. Haha, pretty crazy weather so - fancy clothes in Hamburg? Not really. So, this is my simple look for cold days in Hamburg! Sitting by the river, waiting for my "open kitchen" lunch! Sweater looks awesome on you!